It was fun to see my mom and dad for the final weekend. DANVILLE, Calif. – With my trip to England over, it’s crazy to look back at everything we were able to do in a month’s time. 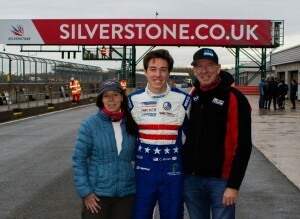 From our first race weekend at Donington to the Walter Hayes Trophy, it has been such an amazing journey. My Walter Hayes weekend was full of ups and downs. Starting with qualifying, I ended up fifth after struggling to get optimal track space. I knew the pace was there but I couldn’t piece it together. The Heat race had similar conditions to qualifying, a dry track and the front pack very close together. I was able to reach second place but after some hard-fought battling I had to settle for fifth. This meant I would be starting 14th in the Semi Final. The track looked dry before we were to head out, but then the rain started to come down. Right off the start into Turn One, a car in front of me spun, so I had to take to the outside. I followed Josh Smith very wide into Turn One, losing some positions but free of damage. I moved my way up into eighth until an unfortunate driving error while battling for position put me back to 12th. I was able to set the second-fastest lap time of the race but didn’t get the result to show what we could do. I started 23rd in the Final. The track was still damp so we ran a wet setup. I got a great start, gaining some positions into Turns One and Two. Into Turn Three, a car spun in front of me but I was to avoid it by taking the outside into Turn Four. I was gutted to see Jake get collected since he had great pace but poor luck all weekend. I continued to make up positions throughout the race, finishing 12th. The overall trip has been such a great adventure for me. I really feel like I’ve improved as a driver, especially with my race craft. The level of competition here is the highest I’ve ever encountered. Having over 100 entries makes for some very interesting racing as well! The Formula Fords proved to be a very different driving style than what I’m used to, so getting to learn different techniques gave me just that extra edge going into whatever I may be driving next. Not to mention the amount of rain driving we did! 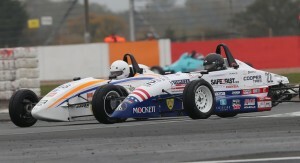 I had only one true rain race before racing in England. 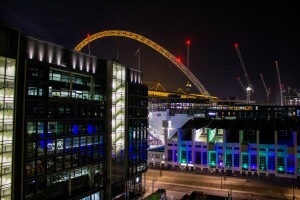 Our AirBnB was a stone’s throw from Wembley Stadium. Everything we got to do off track was truly a once in a lifetime experience. We saw the Donington museum, which has the largest collection of Formula 1 cars in one place before it closed. We saw Ilmor, an engine company that heads the Chevrolet IndyCar engine program. 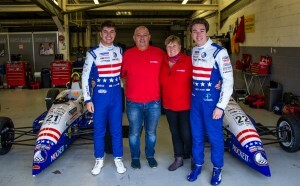 Jake and I rented an Airbnb in London, and from there we took trains to the McLaren Technology Centre, Carlin, West Surrey Racing and MINI Plant Oxford. We capped off our journey with a visit to Mercedes F1 after a day of testing at Silverstone. Looking back at this list I still can’t believe what we were able to do. Cliff and Michelle looked after Jake and me so well! My journey with Team USA has been such an amazing one. I really want to express my deep gratitude towards everyone who made this program possible, especially Jeremy Shaw for giving me this opportunity. Thank you to Cliff and Michelle for letting us into your home and treating us like family! 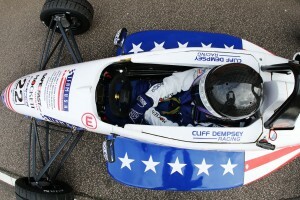 I’m proud to have been a member of the Cliff Dempsey Racing team. Now that I’m home, I’m working as hard as I can to build my season for next year. I’m very excited to see what the future holds!